The SGPC is involved with the management of the south half of the Gifford Pinchot National Forest (GPNF), known as the Mt. 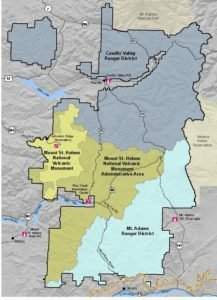 Adams Ranger District. The GPNF is bounded by the Columbia River Gorge National Scenic Area to the south, by Mt. 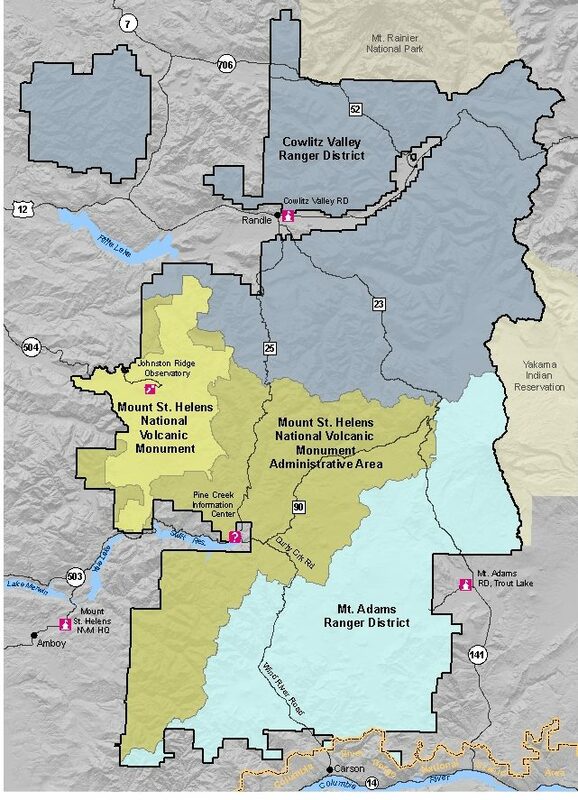 Saint Helens to the West, by the Confederated Tribes and Bands of the Yakama Nation and Mt. Adams to the East, and by Mt. Rainer to the North. The GPNF area is popular for hiking, dispersed recreation, huckleberry picking, mountain climbing, and provides timber that is a valuable source of jobs and revenue for local residents, communities, and counties. The Forest Service management of the GPNF is driven by its multiple use mandate to “sustain the health, diversity, and productivity of the Nation’s forests and grasslands to meet the needs of present and future generations.” To implement this vision, the 1990 (and since amended) GPNF Land Management Plan and the 1994 Northwest Forest Plan form the base management direction for the GPNF. The GPNF Planning page provides further information on these guiding documents. The GPNF publishes a list of projects that are under development on the GPNF Project page and each project provides information on the proposed action and opportunities for public comment and review. The SGPC is highly involved in the development of many of these projects.